The pulsation system regulates cyclic pressure changes which cause the teat cup liners to open and close around the teat-end, massaging the lower part of the teat. Ensure teats are not damaged, leading to issues with mastitis. The right pulsation and vacuum system will ensure cows are not slow to milk. Doesn't cause pain which will lead to cow discomfort and animal handling issues. Ensure milking machinery is completely checked at least once every 12 months and make sure the tester you use holds a current practicing certificate from the MPTA. All pulsation systems are made up of a pulsator (an air switching device), a source of vacuum, connecting pipelines and flexible pulse tubes that connect the pulsator to the pulsation chamber formed between the teat cup shell and liner. The main purpose of pulsation is to limit the development of congestion and oedema in the teat tissues during machine milking which can lead to cow discomfort and teat damage. Pulsation also helps to maintain a high rate of milk flow from the teat within each pulsation cycle and continue to stimulate good milk let-down. Both research and field experience have shown that a relatively narrow range of pulsation rates and ratios is required to ensure good teat-end and udder health, and also to optimise milking speed. The preferred range for pulsation rate is about 55 - 65 cycles per minute and the most common pulsator ratios are 60:40 and 65:35. An example pulsation cycle (at a pulsation rate of 60 cpm) is shown in the diagram below. Milk starts to flow from the teat during the A-phase (or opening phase) of pulsation. Milk flow continues throughout the B-phase (the open phase) and into the first part of the C-phase (the closing phase). 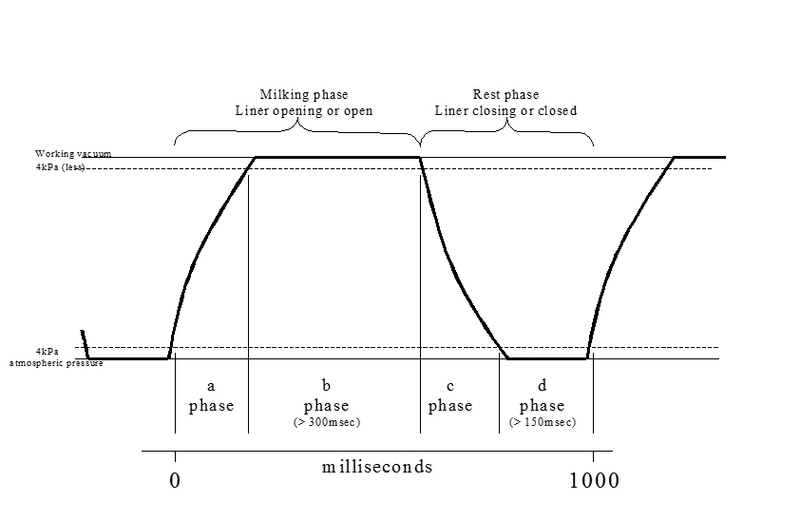 Milk stops flowing at a time corresponding to a point about 50 - 75% down the C-phase curve and the teat canal remains closed throughout the D-phase and into the first part of the opening phase. Pressure is applied to, and released from, all of the teats simultaneously. Bores of 8-9mm are typical. Pressure is applied to two teats while the other two are at rest and then alternate. Bores of 6-8mm are typical. The number of clusters connected to the pulsator will affect pulsation. The subtle effects of inadequate pulsation may be the single most important cause of poor milking performance and machine-related mastitis problems. slow milking times for cows. Look for cracks, splits, or kinks in the pulse tubes, foreign material (dirt, grit, feed particles, or insects) under the pulsator valve seats or lodged in the air inlet ports. Listen closely to each pulsator as a first check for uniformity between units. The sound of air entering the external air port should be regular and intermittent. This simple check is made more sensitive by partially covering the pulsator air port with a finger. A continuous hiss indicates a leak (usually grit or dirt) under the pulsator valve seat. Check that the pulsator air filter or air port is absolutely clear. Feel that all liners are opening and closing fully in a pulsation cycle by turning on the vacuum shut-off valve to each cluster in turn and inserting a thumb into each teat cup. The liner should close around your thumb if the pulsator is working correctly. If faults are found with the pulsation system during milking, or if you suspect the pulsation is not working correctly, then contact your milking machine service provider. Clean pulsator filters regularly (especially in grain feeding dairies), and carry out the simple pulsator checks (below). The pulsation airline is not included in the circulation cleaning system. It needs to be washed out annually and its drain valve needs to be cleaned occasionally. Check with your milking machine service provider on a recommended wash method. Replace any worn components of pulsator units as per manufacturer instructions – pulsator components can be purchased as kits. Have your milking machinery professionally checked every season. The purpose of a vacuum pump is to extract air continuously from the milking machine system. This maintains a vacuum which allows the milking machine to operate. Vacuum pump performance is assessed by measuring the quantity of air flow produced. Use a specialist to ensure the correct size is chosen. They should also be tested annually with an airflow meter. Oil ring vacuum pumps are the most common type. These use an oil layer to create a seal between the side and ends of the blades. Liquid ring vacuum pumps are also popular. These use water rather than oil as the seal. Blower-type vacuum pumps are also being routinely installed as an alternative option to the standard oil seal and liquid ring pumps. Vacuum regulators maintain the desired level of vacuum in the milking machine system, despite fluctuations in air demand. They work by constantly allowing excess air to enter the milking machine so the vacuum pump is continually removing the extra air that the milking machine doesn’t require. Some installations now feature variable speed drive systems to regulate the vacuum level. These operate by electronically monitoring the vacuum level and then controlling the vacuum pump itself to either increase or decrease its speed. The vacuum level must be maintained at a level suitable for the milk line height. Click here for some suggested guidelines. They are generalisations, open to minor adjustment, somewhat dependent on the design of the milking system but are considered ‘safe’. Vacuum level in relation to milk line height based on that recommended by the NZ Milking and Pumping Trade Association. Use the lower vacuum levels listed with large bored long milk tubes or in wet, windy weather e.g., at the start of spring calving when the teats are more easily damaged. With automatic cluster removers, depending on their internal head loss, and after spring, the higher level is acceptable. In practice, it is wise to start the season off with the vacuum level low rather than high, i.e. never start spring calving with a vacuum higher than 46 kPa regardless of the milk line height. Increase to around 48 kPa for herd testing to compensate for the head losses in commonly used milk meters. Improve efficiency and animal health with clusters that suit the milking system, cows, and the milkers.